Giant ants were the terror of the movie Them! (1954). Tonight Rajesh and Howard realize giant ants would be a cool new method of transportation. But Sheldon Cooper is right: unfortunately physics determines that giant ants cannot exist on our planet as we know it. 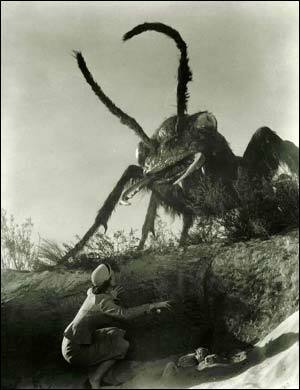 Giant ants in the film Them! (1954) violate the square-cube law. The evolutionary biologist, J.B.S. Haldane, won this argument already in his 1926 essay “On Being the Right Size“. In his essay, Handane did more than observe elephants are larger than mice but explained, using physics, how changes in size demand changes in form. A typical ant we know and love is about 5mm long and has a mass of about 5 milligrams. The giant ants you might like to have around would be 1000 times longer. Not just longer, but 1000 times wider. Not just wider, but 1000 times taller. To calculate the new mass of the giant ant we have to multiply these all togher–a billion times the volume. At the same density, a giant ant would weigh about 5 tons. But its legs would only be wider in two dimensions. They are a million times stronger, but that is not enough–for a creature a billion times heavier. Before taking their first step they would break all their legs, leaving them immoblile and harmless. While mass increases as the cube of size, the function of its structure improves only as the square, hence the name “square-cube law”. Note to bug spray companies: Just make a chemical that grows ants 1000-fold in every dimension. That will stop ants in their tracks. That’s sure to be a best-selling item. Elephants have no problem being 5 tons. But they don’t support themselves with just the flimsy exoskeleton that suffices for ants. We and other animals our size have internal bones to support us. This is just one example of how physics determines that animals must fundamentally change their form if they are to be much larger or smaller. So there is no need to watch Honey, I Shrunk the Kids (1989). If our bodies shrunk to the size of an ant, we would be just as hopeless as the giant ant. As warm-blooded creatures, we humans lose body heat with our surface area, which goes as the square of our linear size. Meanwhile our total body mass decreases much faster, as the cube. Even at such a miniscule size, you would never be able to eat enough to stay warm. Whales, warm-blooded mammals of the sea, benefit from growing so large in keeping warm, especially since water conducts heat away faster than air. But they have no legs to stand on, being able to rely on their buoyancy in water. So physicists could have predicted the largest mammals would live in the sea. 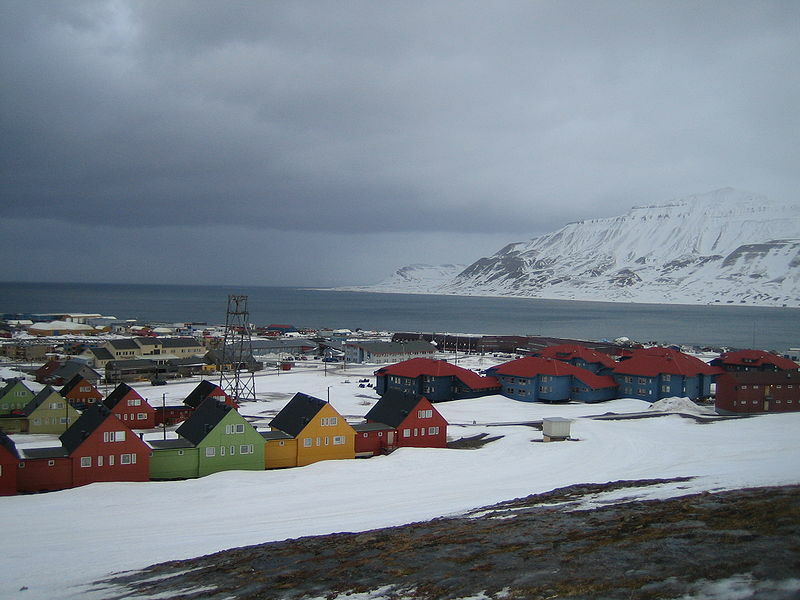 The square-cube law explains why there are no mice in Spitsbergen. Worse still for the giant ants, they bring oxygen into their system directly through their exoskeleton. It is as if you could breathe directly through your skin. That’s a lot less effort than growing lungs, but that won’t work at our size….the volume needing to be sustained by air diffusing through the surface is just too large. Animals had to develop lungs in order to grow to larger. For life, form follows not function, but rather systems serve size. Physics constrains the nature of life. So fear not elephant-sized eagles: Wind speed must increase as the square of length to keep a body aloft, limiting the size of winged creatures. Some physicists, such as Carl Sagan and E.E. Salpeter, have even gone so far as to predict the properties of life on Jupiter in its large gaseous “oceans” of ammonia possibly inhabited by their so-called “sinkers”, “floaters” and “hunters”. If not found on Jupiter, surely somewhere among the billions of Jupiter’s cousins in our galaxy there might be some such life. I went into physics because I didn’t like biology. (Too smelly and squishy.) After teaching physics to life-science majors, I suspect the reverse is also often true. Unfortunately for the biologists though, physics is everywhere, right down to explaining the basic structures of life. Physics cannot determine exactly which life forms we will encounter, the details being largely accidents of history. But whatever path successful lifeforms go down, they are constrained to obey the laws of physics. Now we can think back to Sheldon’s dream last episode. He had a dream that he was a giant but didn’t know it because everything else was increased by the same scale. Sheldon said the reason he knew, was because he was wearing size 1,000,000 pants. But at that point, he must have also realized it was a dream. I don’t think Sheldon would be fooled. After all, TBBT will not be found on the long list of TV shows, movies and comics that have violated the square-cube law.